Leaders’ success is measured by the success of those working in their teams. The best analogy for a leader is an orchestra conductor. This is because the conductor, superb musician though he may be, doesn’t make a sound. His success is getting others to make beautiful music. A coach does not have to be a manager: your coach could be your spouse, partner, co-worker, or friend. But every manager must be able to be a coach, and this is where Unlocking Potential adds value. It is an excellent guide for managers who understand the need they have to coach their people. The late Stephen Covey believed that coaches are neither born nor made, rather great coaches choose to be great coaches. Coaching starts with ‘trust’. People trust leaders who genuinely care about their welfare and future. People trust leaders who always demonstrate personal integrity, honesty, and sincerity. People trust leaders who keep confidences. Trust takes time to earn, but once earned it can be accepted by others. But trust is also easy to lose. It takes only one broken promise, display of indifference or manipulation, one broken confidence, for trust to be ruined. 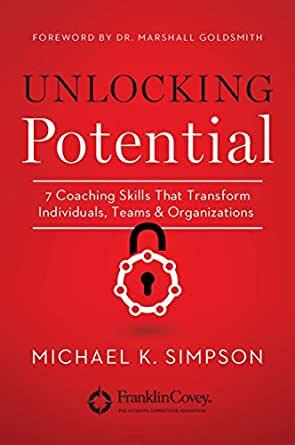 Identifying ‘potential’ in people is the second coaching fundamental. This does take time and requires that the coaches give the person their full, undivided attention in the coaching session. Information is gathered by “listening with the heart for feelings, listening with the ears for content, listening with the eyes for visual cues” to what is not being expressed. Empathy, feeling the person’s feelings, is achieved and demonstrated by accurately reflecting what is being said, experienced, and felt. This is important because great coaches need to create a feeling of safety for people. In this safe environment, the individuals can be helped to change a point of view that is holding them back. This is a delicate and sensitive process, but one necessary for growth. Many people, for example, consider a setback as an omen of failure, and changing this belief can be deeply liberating, and even open the way for realizing one’s potential. When a person learns to align their paradigms to reality, many of the barriers to realizing their potential begin to fall away. People are easily motivated, but this rarely lasts. The third fundamental of coaching is moving way beyond motivation, all the way to real ‘commitment’ to the work. Genuine commitment cannot be demanded, but the authors believe a manager-coach can create conditions that will encourage people to commit to goals they realize they want to achieve. This commitment is beyond requiring the person to do specific things as that opens the way for the person to claim: “I did what you told me to do and how you told me to do it, and it didn’t work—and now what do you want me to do?” Individuals never own what they haven’t committed themselves to. Commitment can be discovered through questioning by the coach: What specifically brings you to coaching? What are the most important outcomes you need to accomplish? What do you see as your ‘best self’ in the future? To help people identify what they can commit to, requires that coaches are more than very capable conversationalists. They must intend to advance to both logical and emotional commitment. For any organization and for every individual, the goal of coaching is to improve ‘execution’ the fourth coaching fundamental. If everything mentioned to this point is successful but there is no improvement in execution, the manager has failed as both a coach and a manager. “All successful coaching conversations need to link directly to actually meeting key performance indicators, measures, and objectives,” the authors explain. These are the fundamentals of coaching, and so the fundamentals of good management, too. The second part of the book is a description of the seven skills required to actualize these four fundamentals. Coaching is far more than counselling, giving pep talks, consulting, advising, or telling people what to do. This part covers how you build trust, challenge paradigms, and help your staff clarify their goals. It describes how to assist your people to execute their goals flawlessly. To do this you will need to give feedback that is effective in helping the person move forward, and not feel complacent. There is advice on how to tap into the talent so many people possess, and how this can be developed. This part includes advice to coaches on how to avoid getting distracted by focusing only on the talented at one end, and the trouble-makers at the other, while forgetting to grow those in the middle. 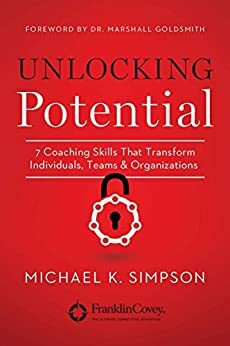 Even experienced coaches will derive benefit from this book, if only to remind themselves of skills they already have, but may not be using. Managers certainly will. *Ian Mann of Gateways consults internationally on leadership and strategy, and is the author of the recently released ‘Executive Update. I was expecting so much more based on the reviews. I didn't find this book practical. A lot was left up to the reader to find the needed action steps to unlock the potential hidden in people. This 146-page book would have been better served as a magazine article. If you are wanting to be a better coach, this just isn't the book for you. Sorry...I really had high hopes. This book is a very incredible, it’s a very powerful motivational book. I highly recommend it! If you enjoy reading motivational books or educational books in business. Then I recommend this one it is a great title and helps you with your personal life, business life, and financial life. I love self-help books and this is a great one. 4.0 颗星，最多 5 颗星Want results? Get this book. Well crafted, highly organized, easy to apply. The seven skills outlined here are essential for any coaching practice or organizational self-assessment.